On this web page I'll discuss how to build a Simplistic castle project for the beginner. You may have arrived at this web page because you need to build a castle for a school project. Or you might be trying to look for ideas on what to make for a science project for school. Others might be wanting to create a basic castle for their pet reptile. 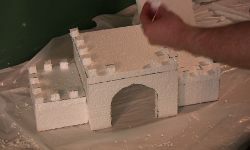 The process of this particular arts and crafts design concerning a model castle is made with a very simple construction. Maybe you don't have time to build an elaborate castle model, or maybe you don't think you have the model building skills to build one of the other castles that are on this web site. I've tried to make this castle model as easy and simplistic as possible and yet still wind up with a structure that couldn't be mistaken for anything other than a medieval castle. In the video below I go over the different steps you can take that deal with whether or not you're building this for a pet reptile or whether you're building a castle for a school project. Check out the Materials List video for everything you need to build these projects on this site! For example: if you're building this castle for a school project you don't necessarily need to add the three layers of grout. The grout is what strengthens the structure and what makes it look like real stone. If you're building this castle for a pet lizard you need this project to be strong so they don't tear into it. 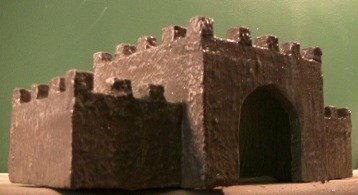 If you're building this castle for a school assignment you don't necessarily need this castle to be strong, but it does improve the "look" of the model castle. Most of the supplies needed to build a medieval castle simplistically can be found at a local hardware store. Some of the other supplies like paint can be found at a store like Michaels arts and crafts or sax arts and crafts. Any arts and crafts design store will do to find the paints and brushes you'll need. Before you start to build a medieval castle -you'll want to search on the Internet for pictures of castles. 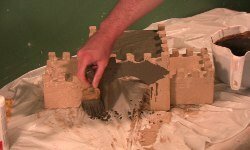 You could just follow the exact guidelines mentioned in the video above, but you might want to look at some pictures in order to get some ideas to make your model castle more realistic. What I used for the endoskeleton of this castle project is polystyrene which is Styrofoam. Like the video above details -I cut out a basic box shape and left it hollow. I then cut out two smaller box like shapes of the same size and glued them to the sides of the original larger box. Then all I did was try to mimic the saw tooth design we often associate with castles -for the top of the castle. I used a glue called loctite's power grab -which is great because you can move very quickly (the glue bonds very quick). This arts and crafts design is very simplistic, so if you're wanting more of a complex castle project check out the other two model castles on this web site. I have an intermediate level castle, and an advanced castle . You could always build all three and have your own castle wars. Even if you aren't building this for a pet reptile you might want to include the grouting stage. If you are building this for a pet reptile you definitely need to do the grouting layers. This is what gives the structure stability and strength. 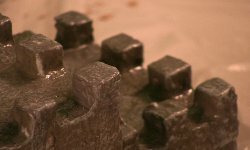 If you're just building this castle for a school project or because you're building war game miniatures -the grout process will still enhance the look of the finished model. I apply 2 to 3 layers of non sanded grout to each project I do on this web site. For heavier lizards such as a bearded dragon, you definitely want at least three layers of grout to toughen up the model castle. Once your grout has dried you'll want to paint it. You can get all the paints and brushes you need at micheals arts and crafts or sax arts and crafts (or any other arts and crafts design store). Usually when you do a search for castle pictures on the Internet 95% of the castles you find are of the color gray. Coloring your model castle gray is a very important step when you decide to build a medieval castle. Then I usually do an arts and crafts design technique called "dry brush". This is a process whereby I load a paintbrush with a very light gray color. Then I remove 90% of the paint from that brush on a rag or paper towel. Then I apply the brush to the textured castle (textured because of the grout). What happens is some of the color from the brush sticks to the texture of the model castle. This can best be understood by watching the video above on how to build a medieval castle. I then proceed to "seal" it. Sealing your castle project is required if you're building this for a pet reptile. If you're building this castle for a school project then sealing it is not absolutely necessary. The sealant will make your project last longer and in the process it will toughen it up. And you're finished! This kids arts and crafts project is a great way to begin building castles without all of the frustration that a complicated model design can give. Be sure and watch the video above and good luck.